Feb 04, 2010 is one of the special days for Bengaluru. BMTC along with the members of the Citizen's community, came up with a brilliant initiative of 'Bus Day'. A day to promote and take the public transport benefits to every person in Bengaluru. 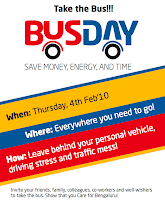 'Bus Day' will be organized on 4th day of every month going forth. Feel free to give feedback on the same. on routine basis to facilitate the regular commuters. You are right Sunnath. I think BMTC has added more buses already starting with the Bus day and from the reports I read, it seems like they have added 300 more buses. Hopefully they will increase them further more. We need more venkatesh s' to initiate and carry things forward.